It is official. 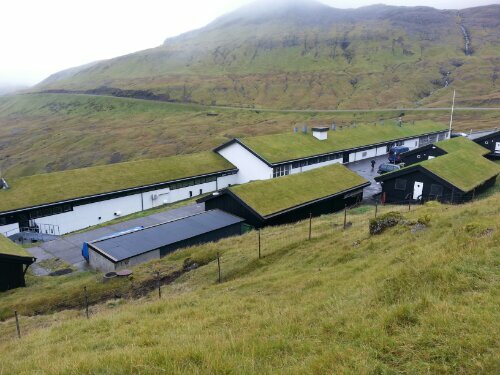 Our visit to the Faroe Islands has been the highlight of this trip. 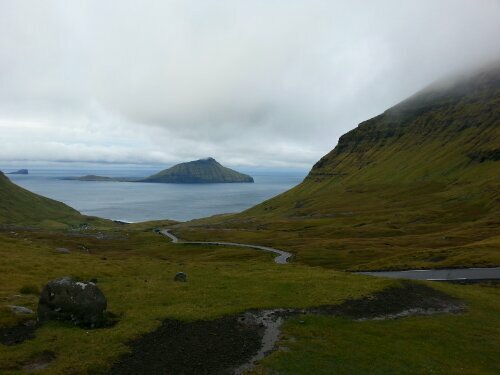 I really enjoyed Bergen of our Norway stops and it was lovely driving around the Shetlands and seeing the grassland and the ponies, but the craggy volcanic cliffs and many fjords of the Faroe Islands were just stunning. Maybe the fact that although cold (44 degrees in the morning), we didn’t get rained on for the first time in days, and the sun actually made a good effort to come out a few times! I booked a private tour for seven us through Tora tours. There were two negatives here that I’ll quickly address then move on from. The first is that I booked a private tour. What showed up was a tour bus with two other groups booked into it. That is not private. The good news (for our group at any rate) that after waiting 5 minutes for the other groups to show up (and checking at the visitor’s center…he picked us up right a the ship as promised) he left. So we ended up with the private tour that I booked, but that left 13 people who thought they had a tour at the side of the road. So first of all, if you really want a private tour, you apparently need to spell it out for them. Secondly, be on time!!!! The second problem was half way through the tour he asked me about payment. I explained that we would all be paying individually by credit card. He told me that he would take us all to an ATM. We had to explain to him that was not the same as accepting credit cards (he figured being able to go into the bank for a cash advance was just fine). One of our party didn’t have his ATM card and needless to say, didn’t want to pay the exorbitant fee charged when doing a cash advance. Well, we’re all friends and it was covered, but that shouldn’t have happened. Moving on from that, this tour was perfect! 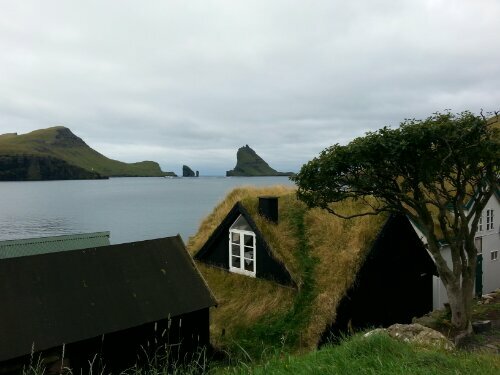 I booked the Visit Vagar tour which was 4 hours of breathtaking scenery and stops in small villages. Including Vagar, which is the westernmost village on the islands. The driver stopped numerous times for photo opportunities and boy did we take advantage. 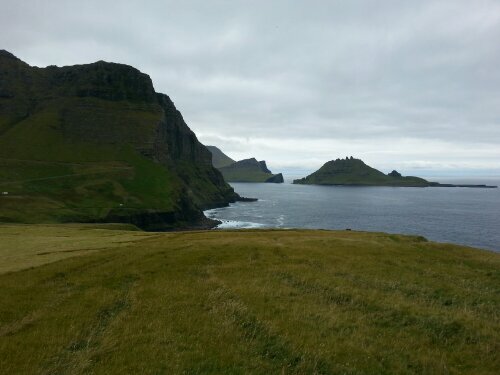 Fjords, cliffs, sheep, grass-thatched homes. This is an isolated land, with around 46,000 permanent residents, but a more stunning backdrop to live ones live against is hard to find (maybe in Hawaii?). Some interesting facts the guide shared with us as he drove; 95% of employment comes from the fishing industry. They export a lot of salmon. There were fish farms everywhere. They grow lamb for food along with fat geese waddling around that are Christmas dinner. A goose runs around 400DKK (considering our tour was 500DKK per person, that’s a pricey goose!). The use of grass to thatch the roofs is an old-style that is back in vogue. It is a great insulator both from a heat and sound perspective and the roofs need to be re-sod once a year. Oh, their “military” and police are all from Denmark. They don’t have their own forces. Unlike the Shetlands where all of the land was fenced in, the sheep and geese roamed freely, causing many traffic slowdowns (the geese have their wings clipped so they cannot fly). Despite the couple of communication problems with this tour company, I would recommend both them and this tour again. Oh another note. If you like souvenir shopping, your only chance on this tour is the gift shop at the airport (thank goodness I ran in to see what they had!). Otherwise you’d need to go into Torshavn after the tour to do your shopping. Believe it or not, this stop was also cheaper than Norway. At 39DKK, my magnet was less than $8…and that’s at an airport no less! I had thought to walk around Torshavn a bit after the tour, but changed my mind. We felt that we had seen a great deal and had fulfilled our touring needs (and hey, I had my magnet!). The city is not far from the pier, but you do want to take advantage of the shuttle that runs you to the information center. It just saves you dodging containers and industrial port traffic. The city is a short walk from the visitors center.